Emblematic king of the French Renaissance, Francis I is the monarch whose name is most closely associated with the Loire Valley. Caption: Portrait of Francis I exhibited at the Château d'Azay-le-Rideau. Born in 1494, Francis of Angoulême was a cousin of King Louis XII of France. When the latter died without a male heir in 1514, Francis of Angoulême ascended the throne under the name of Francis I. 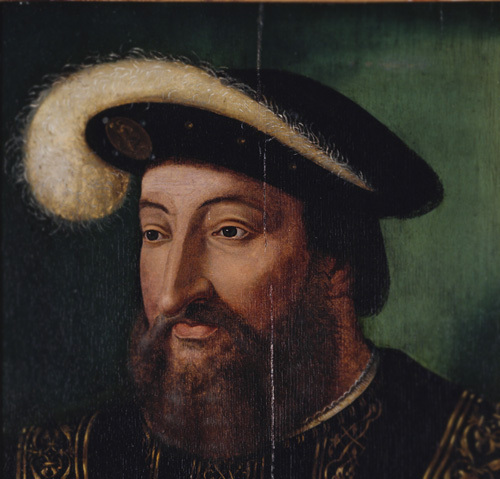 He was crowned in Reims on 22 January in 1515. Soon the young king distinguished himself by his military victory at Marignan, which temporarily gave him authority over the duchy of Milan in Italy. The first years of his reign were marked by two major projects: the expansion of the Château de Blois, from 1515 and the commission for the Château de Chambord, which began in 1524. Francis I elected the Loire Valley for establishing his still itinerant court. Following his example, several major financiers, including Gilles Berthelot to whom we owe the Château d'Azay, in turn built magnificent homes. All these châteaux are distinguished by their new style, greatly inspired by Italian style: following the conquest of the Milanese, Francis I and his close relations enticed Italian artists to come to France, the most famous of whom was undoubtedly Leonardo da Vinci. In 1525, the king was taken prisoner at Pavia. Charles V held him captive in Madrid. Upon the return of Francis I to France in March 1526 the construction sites of Chambord and Blois were suspended. From then on the court would reside in the Île-de-France region. The king had the châteaux of Fontainebleau, Villers-Cotterêts, Madrid, located in the Bois de Boulogne, Saint-Germain-en-Laye and La Muette, built, expanded or restored and planned rebuilding the Louvre. Chambord, however, remained dear to the king, who continued with the building work. On his death in 1547, the château was almost finished.